Sleep or lack of it, is a big issue in many peoples lives. Stop insomnia in its tracks with this Rain Hypnosis Cd for deep relaxation and deep satisfying sleep. Soothing words softly guiding you, combined with sound of rain drops in the background, truly make this Insomnia hypnosis CD, a relaxing and pleasant way to disperse and wash away all your cares and concerns. Many of us experience temporary problems with sleeping, especially when we’re busy or going through a difficult time. When sleeping problems persist we become increasingly irritable, tired and frustrated. When you are suffering with persistent symptoms of insomnia and not getting enough sleep means that just getting through the day can be difficult. 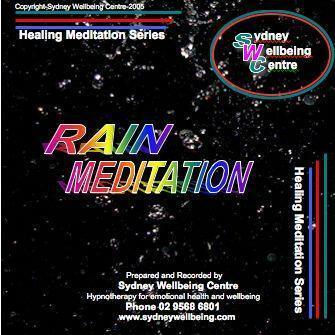 Listening to this rain meditation hypnosis Cd will help you sleep soundly, relieve fogginess, stress and anxiety, fight tiredness and fatigue. It has been found that overall memory, concentration and creativity will also be greatly improved. Not only will your quality of sleep improve but most people report waking up feeling rested and refreshed.